Another beautiful flight for Easy Riser over Queechie. Easy Riser over VT gourge. The Brazilian Clown Balloon in Columbus Ohio. Kenny's Clown Crew in Lexington VA. 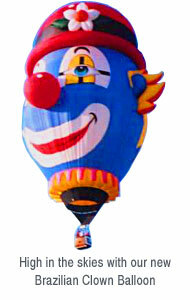 The Clown Balloon Flying Solo. The Energizer Bunny and the Ben & Jerry's Ice Cream balloons. The Energizer Bunny and the Clown Balloon. Glowing Clown in Anderson SC. Davis Klan glowing the clown in Anderson SC. The Clown's first flight in Columbus OH. D & J Banner from Wellsville N.Y. made by Paula Greene. Another D & J Banner from Wellsville NY made by Paula Greene. Ben & Jerry's Balloon in Anderson SC. Just before dark in Anderson SC. With our sponsors in Homestead FL. The Balloonatic, Grant and friends at Greenville NY. Clown Glow in Anderson SC. Clown Crew in Columbus OH.